On March 30th, legislation attacking the rights of employees to form labor unions passed the Florida House, but at this time, fortunately is not predicted to pass the Senate. The legislation targets Florida public school teachers, state and local government employees, bus drivers, nurses, and many others. In 2016, close to 600,000 Florida citizens were represented by public or private-sector unions. Because Florida is a right-to-work state, employees aren’t currently required to join or pay dues as part of a union representing them. However, the legislation would automatically decertify any public sector union if more than 50 percent of the workers represented failed to pay dues to the organization. Notably, it also covers every public-sector union except those representing law enforcement, corrections officers, and firefighters, and would require reporting of specific numbers to the state every year. Some Florida legislators opposed to the bill have alleged that it was designed to specifically go after the Florida Education Association, which is the largest teachers’ union in the state of Florida. The fact that the only outside vocal supporter of the bill is Americans for Prosperity—a conservation group that has received funding from the Koch brothers—has also raised more than a few eyebrows. When asked why the legislation exempted unions covering firefighters, law enforcement, and corrections officers, the bill’s sponsor, Rep. Scott Plakon, responded that there was a “public policy interest” in ensuring that there was a lack of labor unrest when it came to these particular professions because they protect the public from harm. 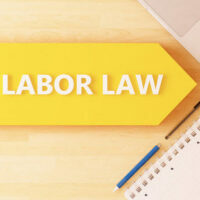 The National Labor Relations Act establishes the right for most-all employees to organize a labor union and bars any unfair labor practices that could interfere with this right. In addition, the Labor Management Reporting and Disclosure Act mandates that governance of labor unions must follow democratic principles. Employers have a duty to bargain in good faith where a majority of employees support there being a union. The right to unionize has recently been the subject of litigation. For example, in January, Uber sued the city of Seattle, challenging its authority to implement a law allowing the company’s drivers to unionize. And last year, workers in New York filed a lawsuit challenging the right for all workers except farmworkers to unionize. In response, the New York State Governor agreed with plaintiffs, indicating that it was a clear injustice to tolerate the abuse and exploitation of workers in this industry. Labor law seeks to ensure that there is equality in bargaining power between employees and employers, including when it comes to economic and social rights. If your right to unionize and/or collective bargaining has been infringed by your employer in Florida, contact us at the office of Robert Norell today for a free consultation to find out how we can help.